This micro wedding was super sweet and colorful! Megan + Bri met at a roller derby after party at Plan B, spent the evening talking about My Little Pony, and everything just clicked from there! They love spending time together fishing, hiking, watching PBS, and playing games, or cuddling with their two kitties, Little and Georgia! Their wedding was very intimate, with just their two sets of parents, Bri's sister, and Megan's aunt, and was absolutely lovely. Megan's dad bought a rainbow umbrella in case of rain, and while it wasn't originally part of the plan, pretty much everyone in attendance had their picture taken with the umbrella, even Judge Kloppenburg! 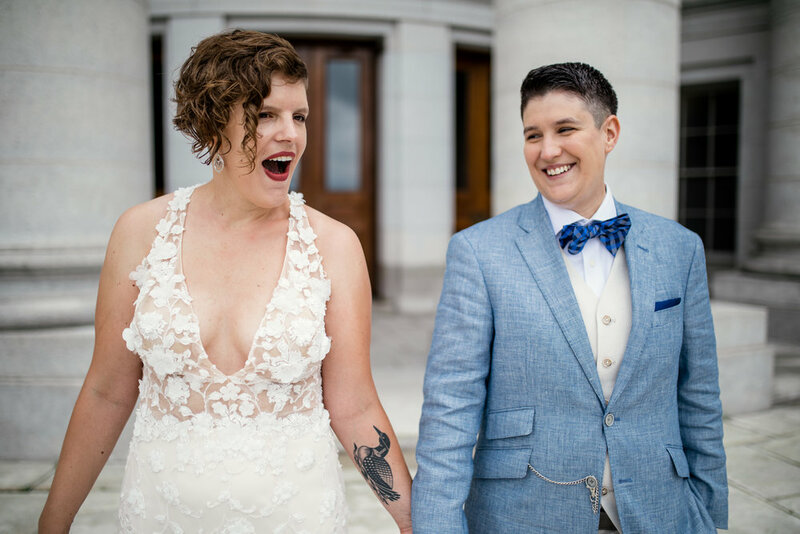 It was such an honor to photograph their wedding, celebrate with them, and cheer with the bystanders at the Capitol building when they said 'I Do'! Congratulations to Megan + Bri! Here are all the vendors (with links) that helped make their wedding day awesome!